Look F-A-B with our Adult Thunderbirds Virgil Costume! Based on the third son of Jeff Tracy, this is an officially licenced Thunderbirds product offering professional hem finishing throughout. 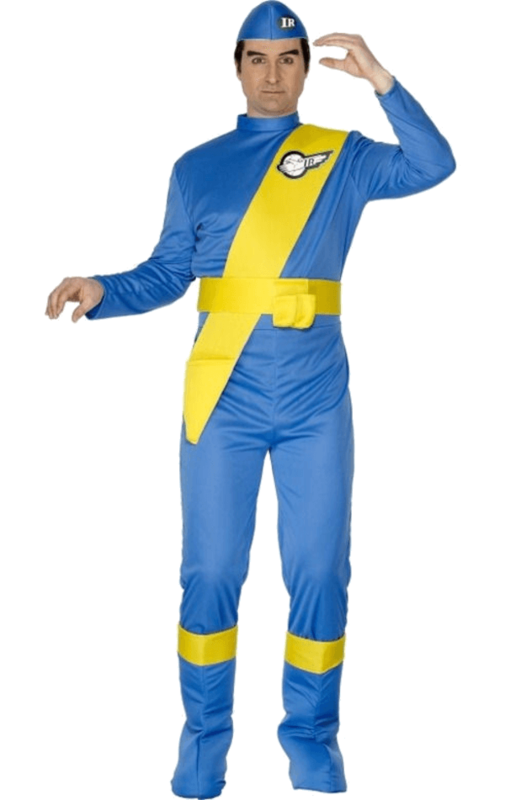 The Virgil costume includes a one-piece blue jumpsuit with short foam collar, rear zipper, and elasticated waist. Costume also includes one pair of blue foam shoe covers with yellow trim and elasticated strap to hold them in place. Covers are worn over your regular shoes to create the look of Virgil’s boots. Covers will fit up to a UK size 11 shoe. Finishing touches include a yellow foam sash belt with pouch, Velcro fastening and printed logo. The co-ordinating hat comes complete with large ‘IR’ International Rescue logo.